Liquivite is a specially formulated liquid diet in the form of a creamy chicken soup. The liquid nature of this food makes it a suitable diet for dogs following an operation, during convalescence or for re-hydration and can be fed through a syringe if necessary. 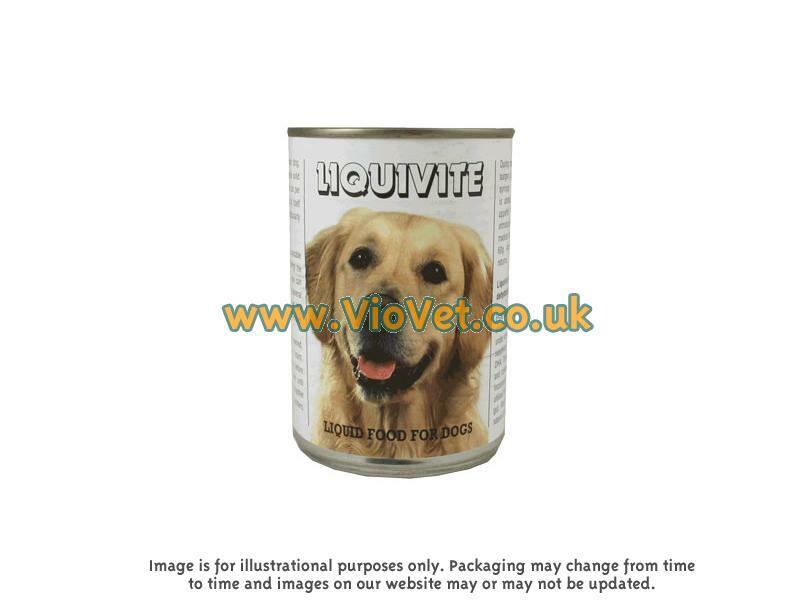 Liquivite is also suitable for weaning puppies over 4 weeks old, helping to introduce meat without offering a solid potion that might be difficult to chew and digest. For this reason, Liquivite is great for senior dogs also, providing a nutritional and delicious diet that does not require concentrated chewing or digestion. Containing a beneficial blend of key vitamins and minerals to nourish and protect your dog from the inside out, supporting internal systems and improving the condition of its skin and coat. Chicken Meat, Chicken Liver, Dried Egg Powder, Skimmed Milk Powder, Fish Oil, Guar Gum, Minerals, Fructo-oligosaccharide, Yeast. Profeed ® pre-biotic 1.0%, Yeast 1.0%, Natural anti-oxidant ( rosemary/tocopherol ) 0.4%. Omega 6:omega 3 ratio is 5:1 Total omega 3 = 0.97%, of which DHA and EPA are 0.78%. Amounts to feed reflect Liquivite's higher moisture content and its role in re-hydrating as well as feeding the sick cat or dog. For cats, introduce at 100g per kg of bodyweight; increase by 50% as appetite returns. For small breeds of dogs introduce at 100g per kg of bodyweight, for medium breeds at 80g, and for large breeds at 60g. Increase by 50% as appetite returns. These directions are given on the labels, as are amounts to feed the weaning kitten or puppy. Shake can well before opening. Once opened, use within 24 hours, refrigerating any unused portion. Return to room temperature before feeding. Liquivite also freezes well, allowing its use over a period of time, for example where small daily amounts are needed for the weaning kitten or puppy. Freeze Liquivite in serving-sized amounts. When required, defrost and allow to return to room-temperature, stir well, and feed as normal. There are currently no questions for Liquivite Liquid Dog Food - be the first to ask one!